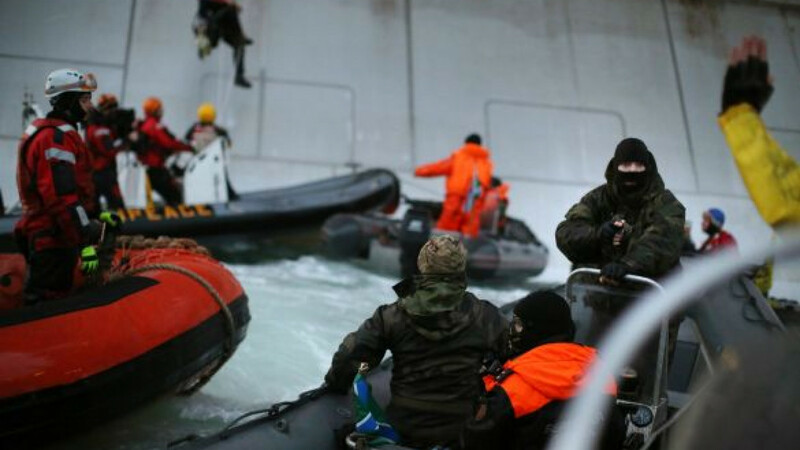 Greenpeace said Wednesday that two of its activists scaled the Prirazlomnaya oil platform in Arctic waters in a fresh protest over the potential threat to the environment from operations slated to start by the end of the year. Production at the Gazprom-owned rig, Russia's first such project in the Barents Sea, was delayed last year after similar action. Gazprom put the delay down to "technical reasons." Hydrocarbon production in its vast offshore areas is seen by Russia as vital to maintaining oil output, the world's largest, at no less than 10 million barrels per day this decade. Global majors including ExxonMobil, Eni and Statoil have agreed on deals with Russia's top oil producer, Rosneft, to enter the region. Their projects are not expected to begin extracting oil before the 2020s. Greenpeace said in an e-mailed statement it sent five boats to the rig early on Wednesday. 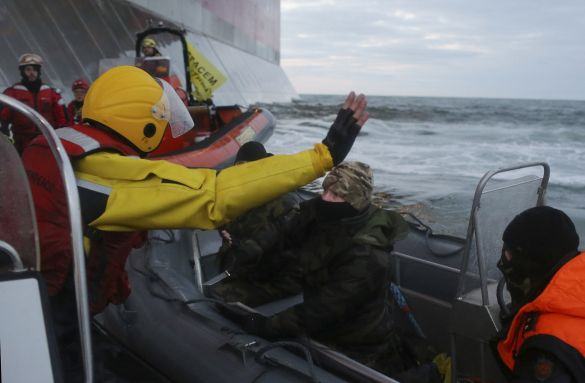 One was arrested by the Russian coastguard, which fired warning shots across the bows of its Arctic Sunrise base vessel. A man identified by Greenpeace as a coast guard officer pointing a knife at an activist on Wednesday. It said two of its members climbed the rig and would remain there as long as possible. "Despite massive financing for Prirazlomnaya, it is not able to guarantee safe production of Arctic oil," Greenpeace said. Offshore safety concerns have grown after BP's Deepwater Horizon oil rig exploded in 2010, killing 11 workers and spewing millions barrels of oil into the Gulf of Mexico. Prirazlomnoye is the first Arctic offshore oil deposit to be developed by Russia and is located in the Pechora Sea, a part of the Barents Sea, 60 kilometers from the northern coast. It is expected to reach peak production of 6 million tons per year, or 120,000 barrels per day, in 2019. Gazprom Neft, the oil arm of state gas export monopoly Gazprom, is expected to obtain a license to develop the field. It expects overall investment in the project to be about 200 billion rubles ($6 billion), of which half has already been spent. Gazprom Neft and Gazprom declined immediate comments.